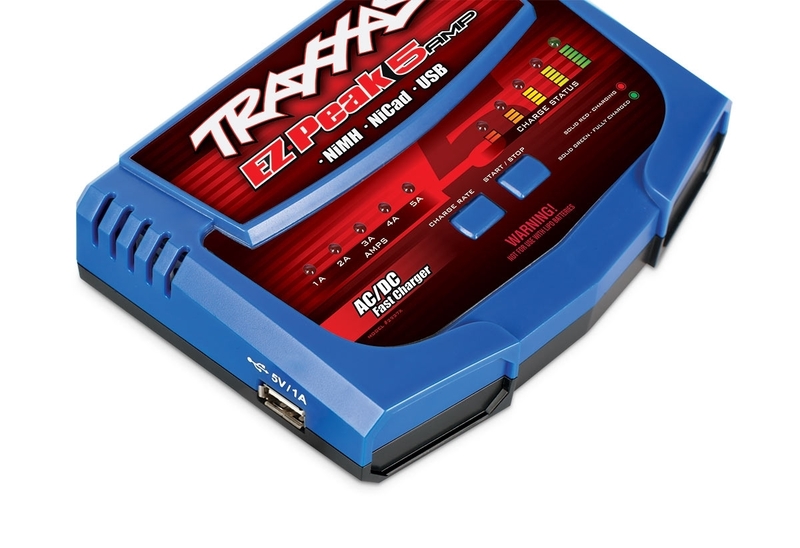 The new Traxxas EZ-Peak™ 5-amp NiMH Charger delivers 25% more power and 20% faster chargingthan standard 40Watt chargers, resulting in less downtime and more runtime. 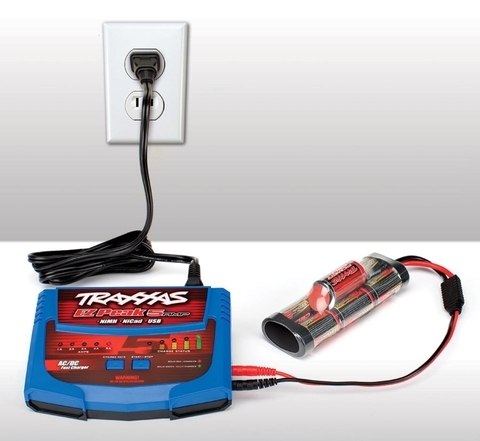 Some chargers advertise fast, 5-amp charge rates, but are only rated for 40Watts of power. Other chargers require connection to a DC power supply or a 12V battery to deliver full charging current. 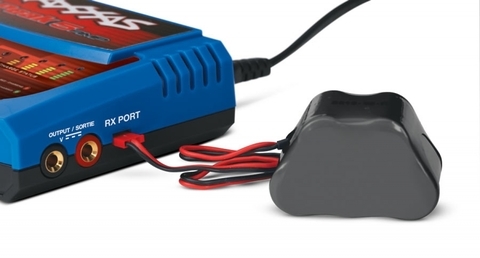 The EZ-Peak 5-amp (available as Part #2937X) delivers 50Watts of power from a standard AC wall outlet to charge 7-cell NiMH battery packs in record time—approximately 35 minutes! 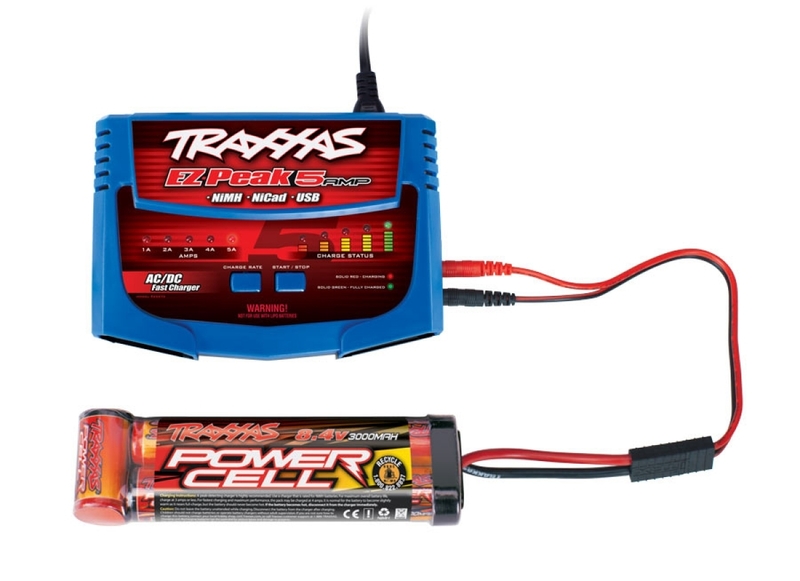 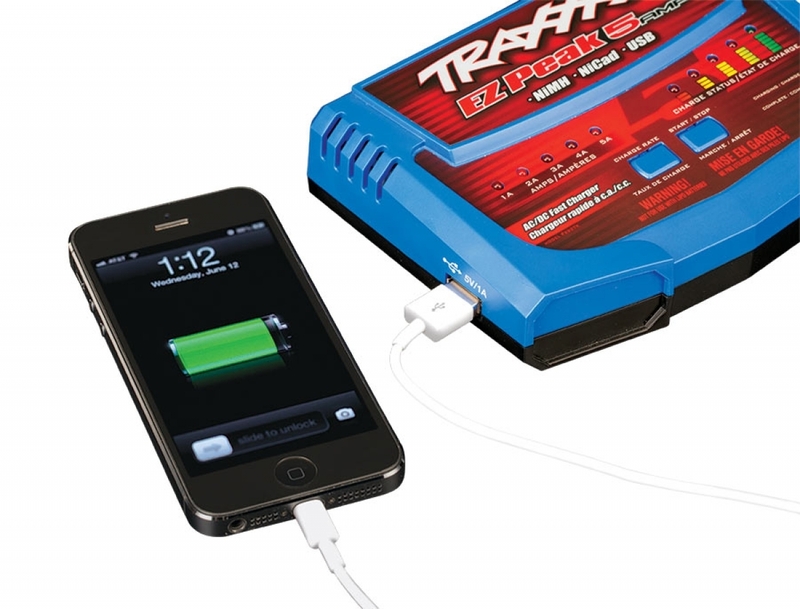 Simple push-button operation with selectable charge rates makes it easy to charge Traxxas Power Cell™ NiMH batteries, 5-cell receiver packs, and 4- to 8-cell NiCad and NiMH packs. Just plug in your battery pack, select the charge rate, and push the "Start" button to begin charging with the EZ-Peak 5-amp. 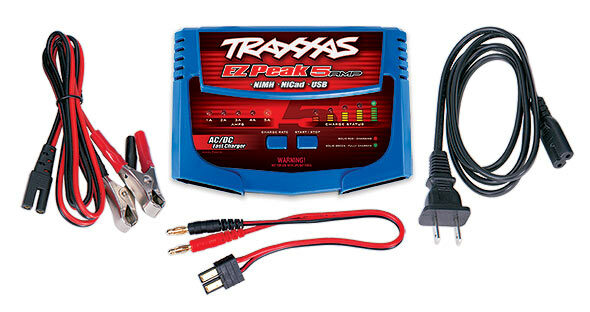 Advanced peak-detectioncircuitry makes sure the battery receives a perfect charge every time. The color-coded charge status LEDs indicate real-time charging progress for foolproof charging, peak performance, and maximum runtime. 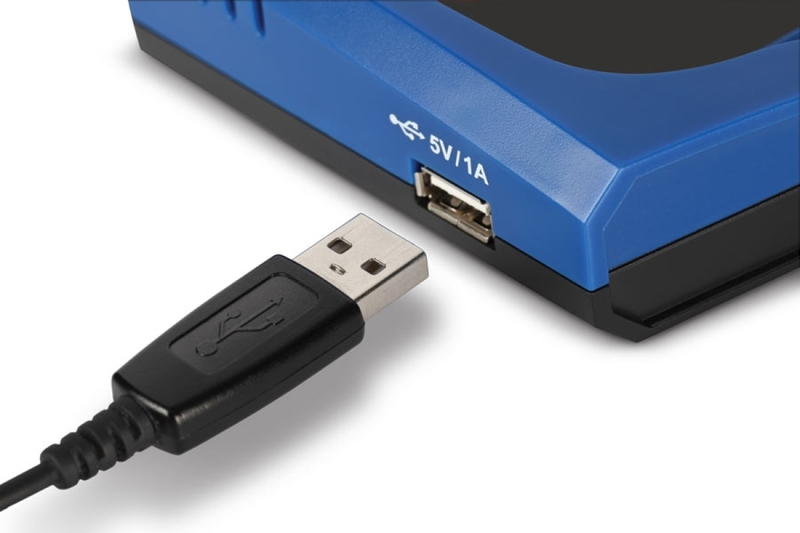 A convenient USB charging port is perfect for charging mobile electronics and is compatible with the USB-powered chargers for the DR-1 and QR-1 helicopters. 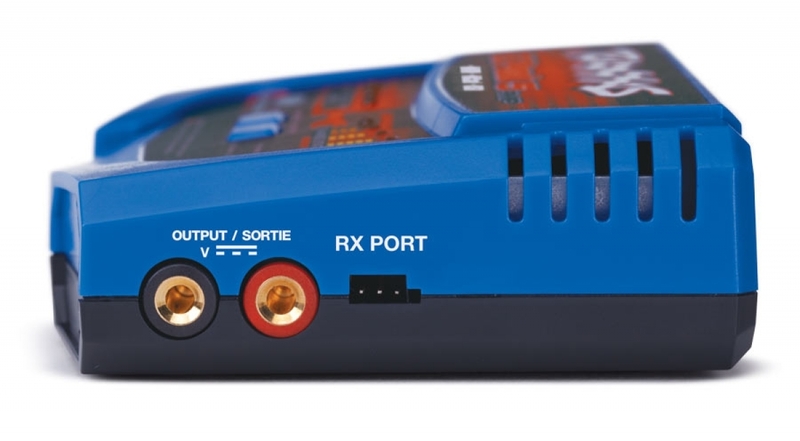 The integrated receiver (RX) battery charge port allows charging of 4- or 5-cell receiver packs. 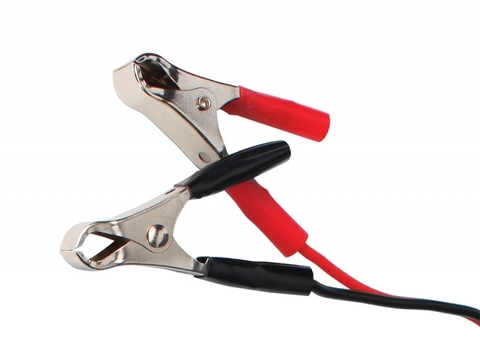 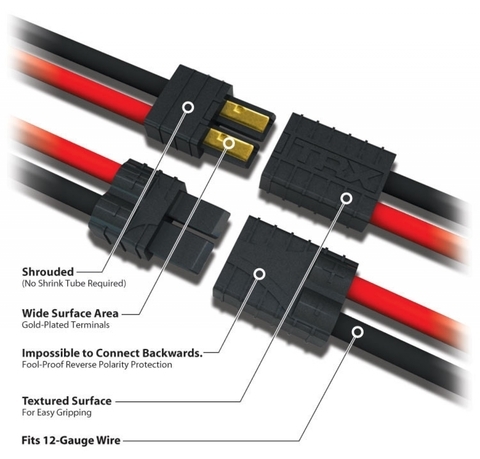 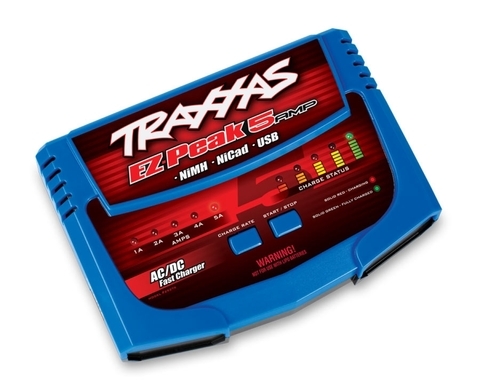 The EZ-Peak 5amp Charger is equipped with a patented Traxxas High-Current Connector for use with all Traxxas NiMH Power Cell packs and all NiCad and NiMH battery packs equipped with Traxxas connectors. Also, the EZ-Peak 5-amp is backed by the Traxxas Lifetime Electronics Warranty for years of reliable service. 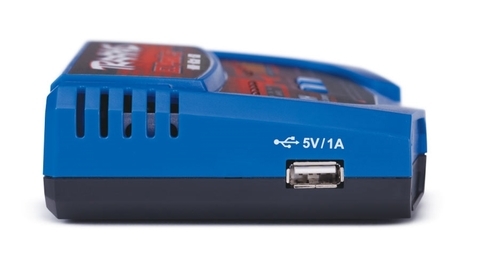 A convenient USB port is perfect for charging mobile electronics and it is compatible with the USB-powered chargers for the DR-1 and QR-1 helicopters. The 5V/1A USB port is on an independent circuit, so you can charge your mobile electronics and batteries simultaneously. 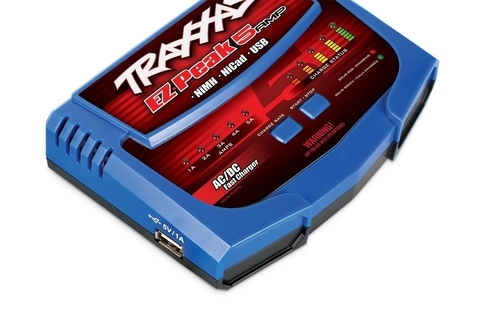 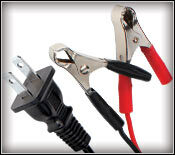 The EZ-Peak™ 5amp NiMH charger is equipped with an integrated RX charging port for charging 4-5 cell receiver packs. 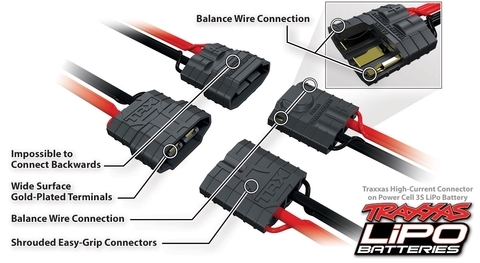 The color coded charge status LEDs indicate charging progress for foolproof charging, peak performance, and maximum run time. 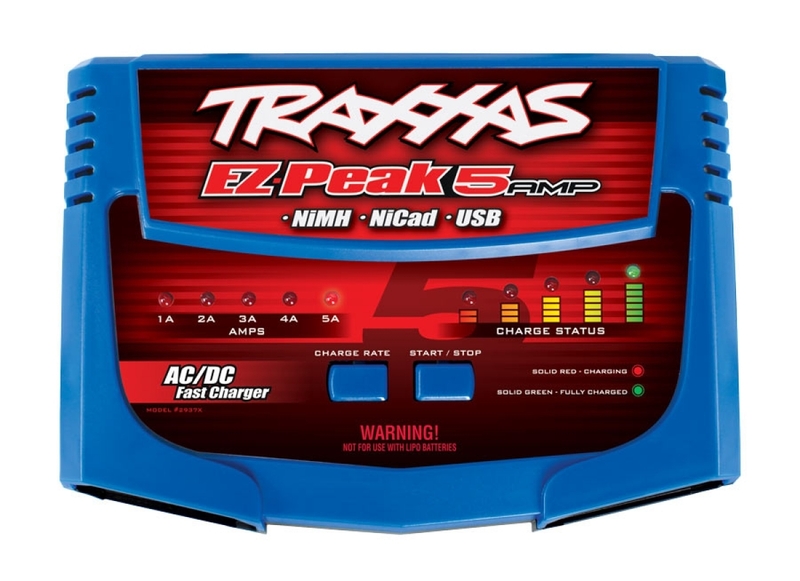 The EZ-Peak™ 5amp NiMH charger is equipped for both AC and DC power, allowing you to charge your Power Cell battery packs almost anywhere. 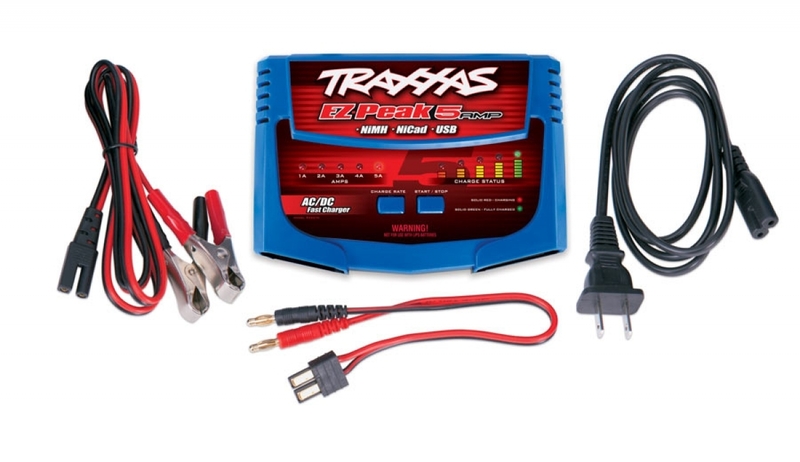 The EZ-Peak 5amp charger is equipped with a patented Traxxas High-Current Connector for use with all Traxxas NiMH Power Cell packs and all NiCad and NiMH battery packs equipped with Traxxas connectors.